Easy to Install. Even Easier to Maintain. The Higher Power Door is the cutting edge of hydraulic doors today. Building cost are significantly reduced with its self supported design. The Higher Power Door has challenged other hydraulic door competitors by raising the bar in terms of hangar doors for general aviation and commercial jet hangars. Our hydraulic doors are built strong and built to last! All of our hydraulic door systems are custom-built for a wide range of industries and are distinguished for their security, strength, and they are virtually maintenance free. Our hydraulic door can be used on almost any type of structure and is set apart from other hangar door designs. You probably won’t find another vertical lift door that can be installed onto a steel frame, wood frame, or fabric structure for the same money. This hangar door system can be assembled quickly because the door arrives as bolt-together parts. The shipping package is small, usually 2-1/2 feet wide, by 2 feet high, by the width of the door. Large doors come in bolt-together sections. Also, the customer can choose how to power the door. Electrical power required can be 240 volt AC, or 12 to 24 volt DC. All fittings and weather seals are provided. Every Higher Power Door is built to engineering specification. We do ask that you ensure the door we quote you is built to the wind load category that your zone requires. Each cylinder is custom designed with holding valves built into the cylinder— not an afterthought elsewhere in the system. To activate the door the operator must constantly press the up/down switch. Door opens, closes, stops and reverses at any height. Cylinders mount inside the slide column and gives your structure the side clearance and open vistas you want. The Hydraulic Door cylinders attach to its own framing and are hidden within the vertical columns. There are no hinges to wear out or repair and this hangar door design doesn’t impose vertical or horizontal loads on your structure. Simple, easy-to-follow installation instructions. Door bolts together without special tools. Do it yourself and enjoy full factory-support and 5-year warranty. Professional installation assistance available from Higher Power Hydraulic Doors backed by 6-year warranty. Once installed, this door is virtually maintenance free. Installs on new or existing structure (adapts to pole barn wood frame with no additional header requirements). Add optional windows or pass-through door in the style and size you want. Bad weather stays on the outside as each door has weather seals on all four sides, with double seals on the sides. The doors are also normally built to withstand 115 mph winds, but they can be designed to meet any local code. Positioned midway up the door is the stiffening truss. Its position is an important feature as it allows for complete snow removal and barrier-free access to a pass-through door. Higher Power Hydraulic Doors are made Certifiably in the U.S.A. When considering a hydraulic hangar door for your project, it is important to realize and understand what impact the hangar door will have on your building. 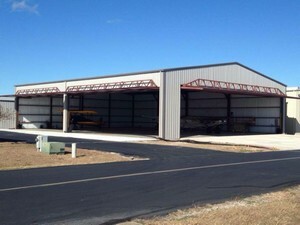 We encourage you to focus on building the perfect hangar for your needs. Whether you design your building for small aircraft storage or as a large commercial aircraft hangar, our doors will fit your building as if it was part of the original design. "Common sense - the ability to reach intelligent conclusions. A sense that implies a reliable ability to judge and decide with soundness, prudence, and intelligence." Free Standing - Self Supporting Hydraulic Door. No massive headers or horizontal bracing required. Requires only 6 1/2 inches of headroom. Moving parts are machined or bearing surfaces. Great for Commercial, Agricultural, and Aircraft Hangar Doors. Call us today for a quote on your Higher Power Door!